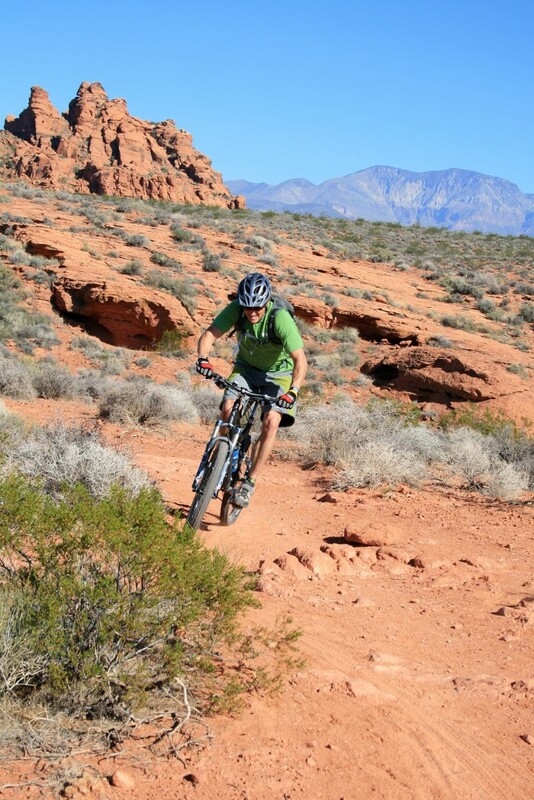 I sat and stared at my mountain bike –then at the trail – then back at my bike. Slowly riding up to the edge of the drop, I envisioned this move. In my head I calculated the perfect speed to clear the lip. I saw myself in the air; sailing and then slowly, but forcefully, pushing my front end down to make a perfect trajectory landing. But would it really be that easy? My heart was racing. Today would be the day. With a rapid escape of breath, I pushed off down the trail. Speeding down the approach, I thought "am I going to grab the brakes this time or am I going to go?" I stopped and convinced myself that I was just checking my speed. I turned around and headed up the hill a little farther. My riding buddy was waiting there with a focused look in his eyes. Was he as anxious as I? Was he going to do it today? If he goes, I gotta go. All of a sudden, without a word, he rode away - hard. I thought, "Oh My God, he's going for it." But he stopped too. Wow! I almost thought I'd miss it. We resolved that the next run would be the one. I rode to the bottom with a camera, not wanting to miss it. I waited there for what seemed like forever. My heart was pumping so hard that you would have thought it was my turn. I held the camera steady, waiting. I heard him first and knew he was going for it this time. There was no hesitation in those tires, no brakes fluttering. I held my breath when I saw him launch in the viewfinder, snapped the photo and put the camera down. Oh, my God! Push down. Push Down! His front end was way too high and the ground was coming up at him- fast. He tossed his bike in mid-air and tried to jump. The landing was not pretty. But, he had tried and, miraculously, he wasn't hurt. How could I be considering this? I just watched my friend eat serious dirt. However, convinced that I had learned from his mistake, all I would have to do is follow though and push my fork down. Hard. So I moved into position once again, this time quite calm. I would begin this run-up even farther up trail then my previous attempts. Turning around to see if my companion was ready with the camera, I started riding. No hesitation. It felt intense. The air was flowing past me faster and faster. Would I grab the brakes? The thought wouldn't leave my mind as my feet pedaled faster and faster. But no hand movement occurred. I maintained control. I may have shut my eyes, just for a second, before my tire left the ramp and I was airborne. Flying, sailing, soaring are the emotions that I can express about my millisecond of victory. After I landed, the greatest thought came to me. This is my home, Washington County, Southern Utah, and I can experience these emotions every day. 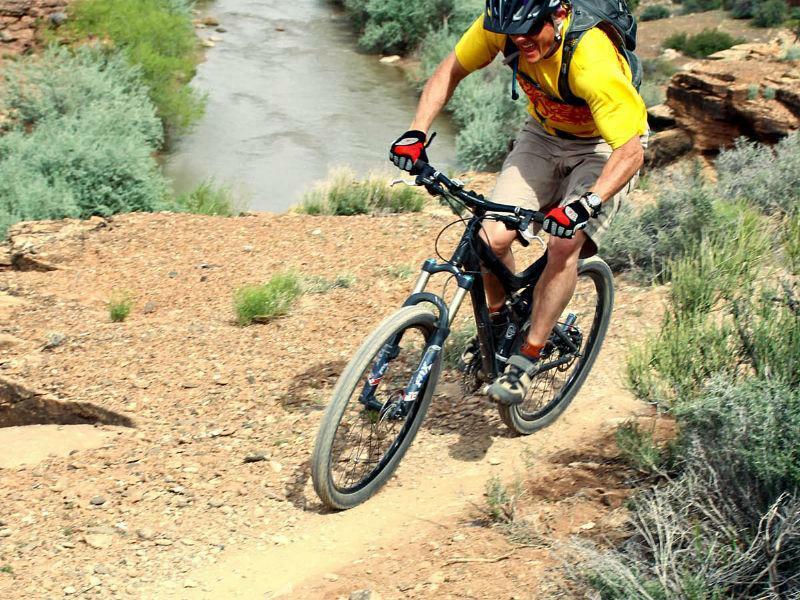 Most people travel many miles, even across the country, to ride on technical trails to have a similar epic experience. My riding heaven is in my own back yard. The amazing adventures are diverse, and all within a short drive. The county's trails are designed and laid out according to the terrain- with the difficult and more technical trails situated farther away from developed communities and shorter, less technical cross country rides closer to towns. 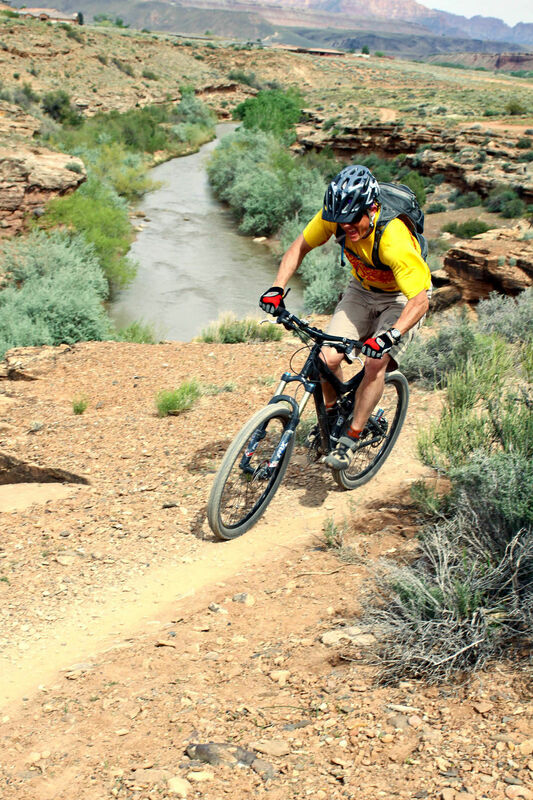 These amazingly diverse trails are great, whether you are 8 or 80, beginner or expert, prefer technical terrain or rolling hills. All are laid-out as interconnecting loops, which allow rides to be customized to suit one's ability and interest. Within trail corridors, alternative "lines" have been built into the route to add additional challenges as skills improve. Even more challenging are county's three competitive racing events. With event categories ranging from youngsters to seniors, all riders can test their skill level against others of similar ability and age. There are even events staged for competitors over 55 held at the Huntsman World Senior Games each year in October. In all, there are over 200 miles of marked, designated mountain bike trails available to ride in Washington County, over 80% singletrack. There is also an additional 50 miles of paved bike routes for shorter rides. Many pathways lead directly to urban trailheads. And the good news is that it doesn't stop there. Many more trails are planned for the county through the Washington County Regional Non-Motorized Trails Masterplan – a cooperative partnership between eleven communities, the BLM, Washington Country, and private developers. When the plan is complete the area will offer over 500 miles of interconnecting trails for all abilities, and all non-motorized user groups. With the increased interest in heritage tourism, many of the routes will provide education and interpretation about the county's history, culture and roots. There are also trails for those who prefer to travel on foot or horseback. While most trails are shared use, some remain specialized to one individual activity. And more trails are being constructed every year. So challenge yourself. Find your personal victory in Washington County. 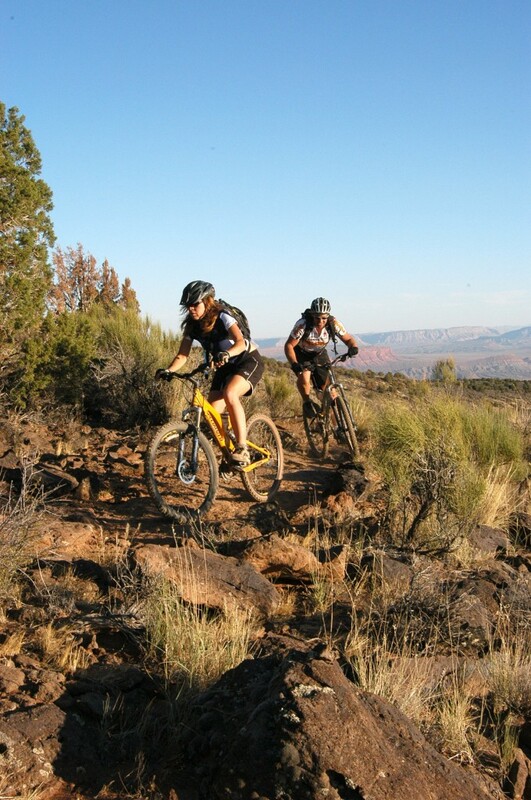 For more information on local trails contact the Bureau of Land Management, 435-688-3200 or local bicycle shops, Red Rock Bicycle, Bikes Unlimited, Desert Cyclery and Springdale Cycles.